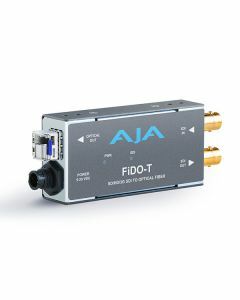 FiDO-T is AJA's single channel SDI to LC Fiber converter with looping SDI output. FiDO is a family of SDI/Optical Fiber converters. FiDO allows the transport of SDI, HD-SDI, and 3G SDI over distances up to 10km using standard single- mode fiber optic cable, with your choice of LC, ST, or SC connectors, depending on the converter model. FiDO converters meet all relevant SMPTE specifications and are rugged, versatile, and suitable for indoor or outdoor use. With 9 models, FiDO offers unmatched flexibility and cost efficiency. FiDO dual channel models allow the conversion of 2 channels—perfect for 3D, dual- link SDI, or 2 completely independent SDI channels (for example, SD, HD, and 3G can be mixed in any combination). Also, FiDO converters offer electrical isolation useful for eliminating ground loop problems. FiDO converters come in a compact, low-profile enclosure for use in tight spaces around and behind equipment racks, trucks and crowded facilities.